↑ Tablet A 3519, in the collection of the Oriental Institute, University of Chicago, CDLI, a late Babylonian copy of a monumental inscription. ↑ For example BM 90287, 11-line brick inscription in the British Museum, CDLI. ↑ "Synchronistic Chronicle" (ABC 21), tablet A, K4401a, lines 1 through 4. ↑ El Amarna tablet EA 10 (BM 029786, in the British Museum), CDLI, ORACC Transliteration lines 8 to 10. ↑ CBS 1108 brown agate seal bearing 7 line Sumerian inscription, University Museum, Philadelphia. ↑ J. A. Brinkman (1999). "Karduniaš". In Dietz Otto Edzard. Reallexikon Der Assyriologie Und Vorderasiatischen Archäologie: Ia – Kizzuwatna (Volume 5). Walter De Gruyter. p. 423. ↑ J. A. Brinkman (1976). Materials and Studies for Kassite History, Vol. I. Oriental Institute of the University of Chicago. p. 169. N. 2.1. ↑ C. J. Gadd (1975). "XVIII: Assyria and Babylonia, 1370 – 1300 BC; New influences in art". In I. E. S. Edwards; C. J. Gadd; N. G. L. Hammond; S. Solberger. The Cambridge Ancient History, Volume II, Part 2, History of the Middle East and the Aegean Region, 1380 – 1000 BC. Cambridge University Press. pp. 44–45. ↑ Piotr Bienkowski; Christopher Mee; Elizabeth Slater. Writing and ancient Near Eastern society: papers in honour of Alan R. Millard. p. 178. ↑ Strommenger, Eva (1964). 5000 Years of the Art of Mesopotamia. New York: Harry N. Abrams, Inc. p. 170. ↑ Gwendolyn Leick (1988). A dictionary of ancient Near Eastern architecture. Routledge. p. 237. ↑ Henri Frankfort (1996). The art and architecture of the ancient Orient. Yale University Press. p. 128. ↑ Magnus Thorkell Bernhardsson (2006). Reclaiming a Plundered Past: Archaeology and Nation Building in Modern Iraq. University of Texas Press. p. 139. ↑ Milbry Polk; Angela M. H. Schuster (May 1, 2005). 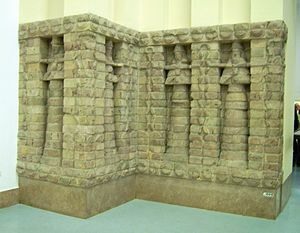 The looting of the Iraq Museum, Baghdad: the lost legacy of ancient Mesopotamia. Harry N. Abrams. ↑ Leonhard Sassmannshausen (2004). "Babylonian Chronology of the 2nd Half of the 2nd Millennium B.C.". In H. Hunger; R. Pruzsinszky. Mesopotamian Dark Age Revisited (PDF). Vienna: Verlag Der Österreichische Akademie der Wissenschaften. pp. 157–177. ↑ Betsy M. Bryan (2000). "The 18th Dynasty Before the Amarna Period". In Ian Shaw. The Oxford History of Ancient Egypt. Oxford University Press. p. 246. ↑ Amélie Kuhrt (1995). The ancient Near East, c. 3000-330 BC. Routledge. p. 340. ↑ Amanda H. Podany (2010). Brotherhood of Kings: How International Relations Shaped the Ancient Near East. Oxford University Press. p. 181. ↑ James Henry Breasted (1906). Ancient Records of Egypt, Vol. II: The Eighteenth Dynasty. University of Chicago Press. p. 204. ↑ Dominique Collon (2005). First impressions: cylinder seals in the ancient Near East. British Museum Press. p. 58. ↑ Leon Legrain (March 1922). "Five Royal Seal Cylinders". The Museum Journal. The University Museum, Philadelphia. XIII: 70–77. ↑ Daniel T. Potts (August 13, 1999). The Archaeology of Elam: Formation and Transformation of an Ancient Iranian State (Cambridge World Archaeology). Cambridge University Press. p. 233.